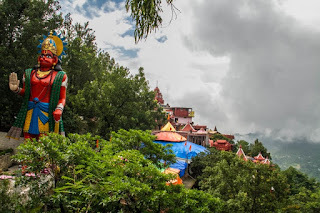 Nadeshwari Mata Temple is one of the famous tourist spot in sui village near India Pakistan Border.The Nadabet area to respectively 15 kms from Sui village. 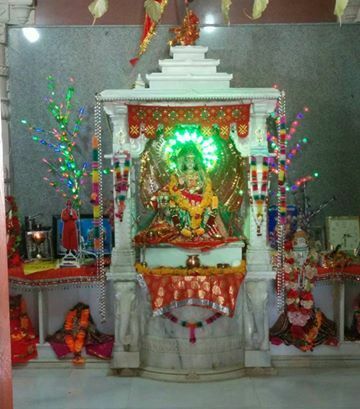 This area is another village of jaloya 30 kms.Here is some fact about Nadeshwari Mata Temple in Sui village Nadabet Near India Pakistan Border in Banaskatha Gujarat India. 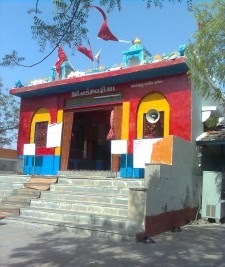 Nadeshwari Mata Temple is located at Sui village Nadabet Near India Pakistan border in Banaskatha District Vav Taluka.Nadabet is a military post situated 20 km from Sui Village near the Pakistan border.The temple is situated on the left side of the beautiful lake .The old temple is very oldest and built by BSF personnel of Nadeshvari maa but in Earth quick temple is damage so new renovate temple is built in 2015 by Nadeshwari Mata Temple Trust about 2.5 Million cost.The temple is dedicated to Goddess Nadeshwari.Hanuman temple is situated on the north side of the house . 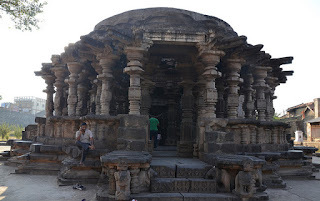 According to folklore, the King of Junagadh Navdhan had stayed here with his huge army while on his way to rescue his sister Jashal from the clutches of the ruler of Sindh. At that time, a Charan girl had provided food to the army and had guided them to ensure a safe passage through the desert. This Charan girl is worshiped as Nadeshwari Mata. 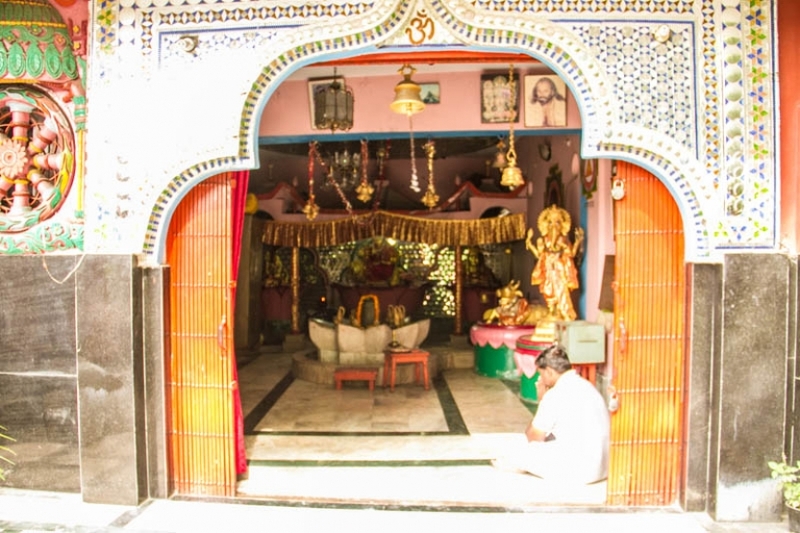 In the past the Chauhans ruled over Nadabet and before independence it used to be prosperous.It is said that during times of drought, when people migrated towards Sindh, they first offered prayers here. 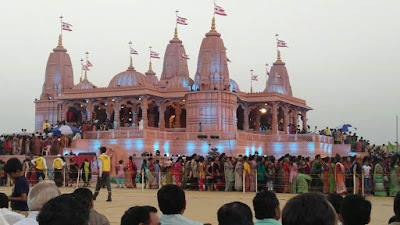 Nadeshwari mata temple, Suigam is the best way to have a memorable time with kids and family.Nadabet ramanvami Mataji temple fair , which is one million pilgrims .Now a days this temple is make a tourist spot and to see India-pakistan border and meet BSF Jawan of Indian Army for people permitted by Gujarat Government. 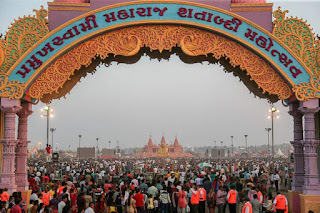 By Air: There is closest Airport but Nearest Airport is Ahmadabad Sardar Patel International Airport within 240 KM from Nadeshwari Mata Temple Sui Village. 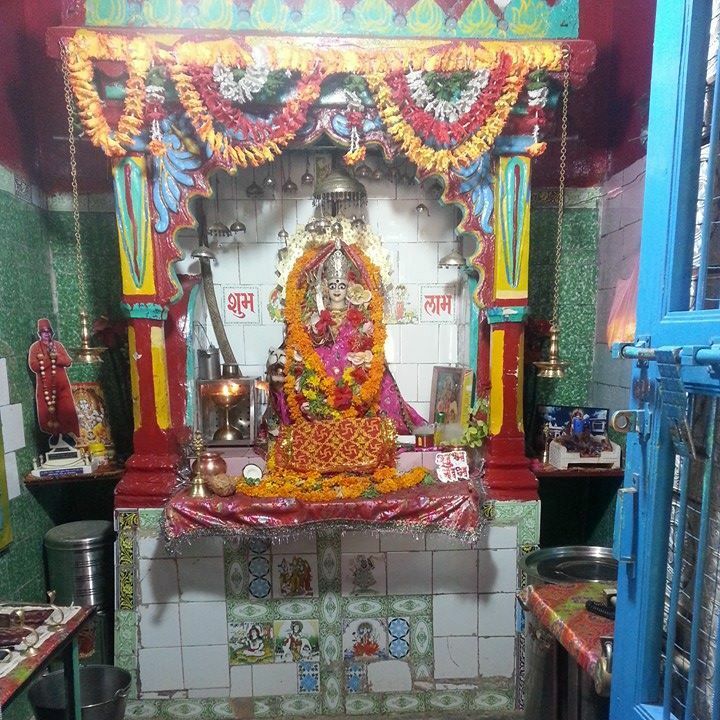 By Rail: The Nearest Railway station is Bhabhar Railway station just 45 KM of Nadeshwari Mata Temple Sui Village. 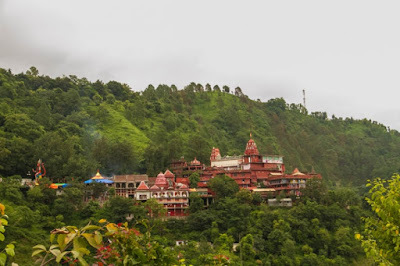 By Road: There are many public and private vehicles and Travels available to reach Nadeshwari Mata Temple Sui Village.You can reach your private vehicles. 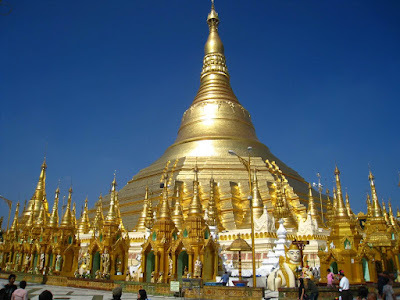 Shwedagon Pagoda or Paya is the biggest and the grandest Pagoda in Myanmar.The pagoda is one of the main tourist destinations in Myanmar.The Shwedagon Pagoda is a great cone-shaped Buddhist monument that crowns a hill about one mile north of the Cantonment. Here is some fact about the Biggest and Grandest Pagoda Shwedagon Pagoda in Yangon Myanmar. 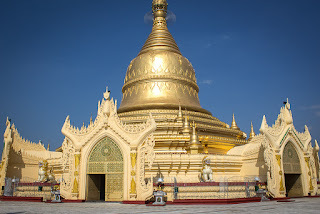 Shwedagon Pagoda is located at Yangon Myanmar. 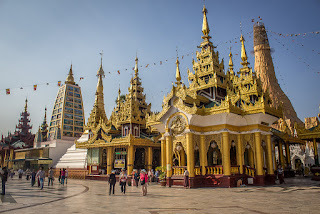 The pagoda is one of the main tourist destinations in Myanmar.Shwedagon Pagoda was 2500 years old, over the years it has been destroyed by earthquakes and had its treasures pillaged many times, only to be rebuilt; the structure has existed in its current form since 1769.The Shwedagon Pagoda is a great cone-shaped Buddhist monument that crowns a hill about one mile north of the Cantonment.Originally, the pagoda was only 8.2 meters high but now, it stands close to 110 meters. 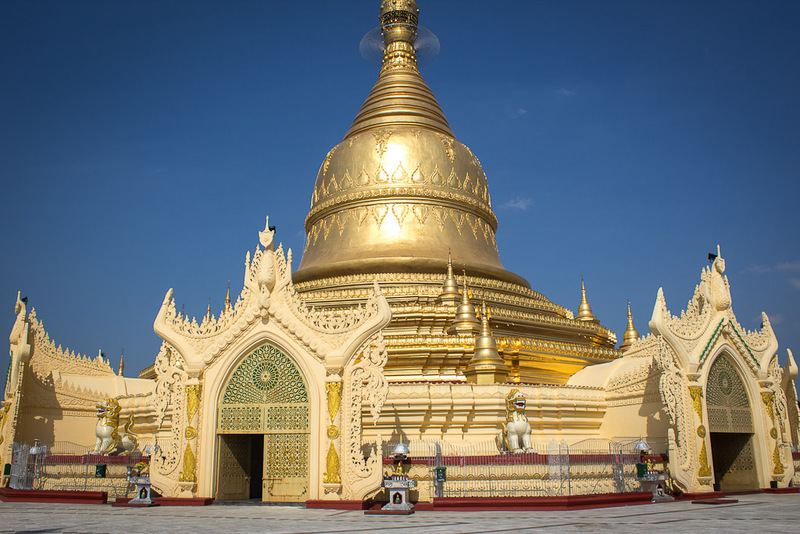 Covered with hundreds of gold plates with the top encrusted with 4531 diamonds, the largest of which is a 72 carat diamond, the Shwedagon Pagoda in Yangon is clearly one of the wonders of the religious world and one of the best treasures of architecture, sculpture and arts. 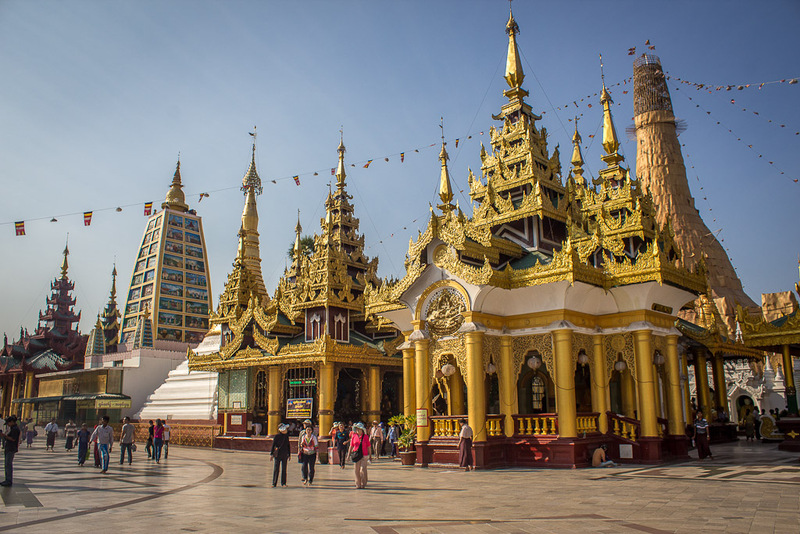 The Shwedagon Pagoda consists of hundreds colorful temples, stupas, and statues reflecting the architectural era spanning almost 2,500 years. 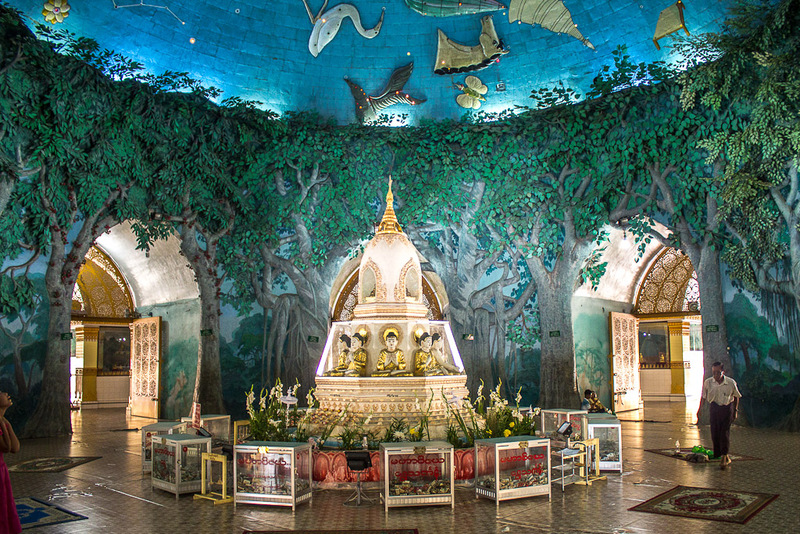 To have an exhaustive look at the golden pagoda, visitors will experience an insider’s view of this magnificent symbol of Buddhism to the lives of the Myanmar people. 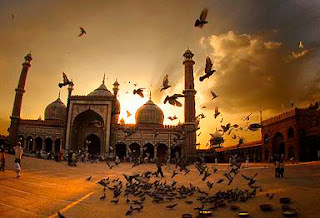 Jama Masjid situated in the ancient town of Old Delhi, 1 km west of Red Fort is one of the grand architectural examples of the Mughal era. 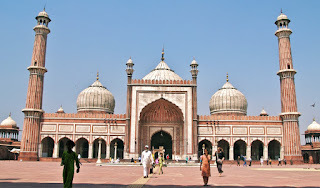 The mosque is India's largest mosque and the last architectural work of the Mughal Emperor Shajahan which is much simpler than his other secular buildings. 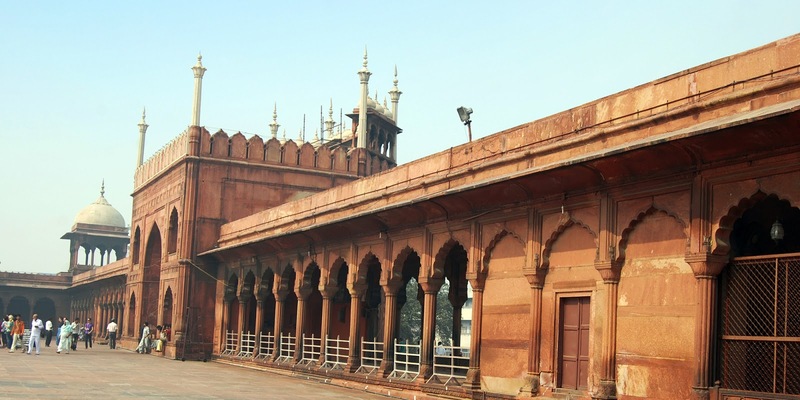 It is also red in color originally erected as a primary mosque of Shah Jahan. 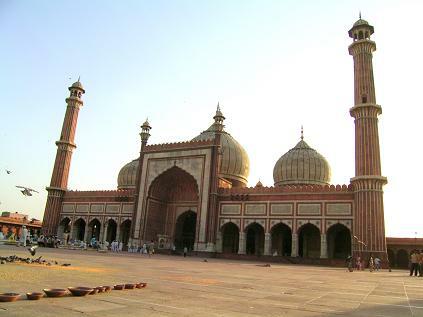 Here is some fact about Jama Masjid in Delhi. Opening Timing: 7am to Noon,1.30pm to 6.30pm. Jama Masjid in Dehi is the largest mosque in India and was built to 1650 to 1656AD.It is built by Mughal Emperor, Shahjahan.The last architectural work of the Mughal Emperor Shajahan which is much simpler than his other secular buildings.The mosque has three gateways, four angle towers and two minarets standing 40 m high. 5,000 laborers were employed for six years to complete its work in 1656. Designed by Ustad Khalil, the great sculptor of his time, it was built at the cost of 10 lakh (1 million) Rupees. Commonly called as Friday Mosque (as 'Jama' means Friday, which is the holy day of the Muslims) the mosque is made of red sandstone and marble. Jama Masjid was inaugurated by an imam from Bukhara, present-day Uzbekistan.25,000 people can pray in the courtyard of Jama Masjid at a time and it is India’s largest mosque. Jama Masjid is an elegant monument also famous by another name, "Masjid-i-Jahan Numa" (visible to the world).Also note that the prized possession of the mosque are a hair of the beard of Hazrat Muhammad, his used chappal (footwear), the canopy of his tombstone, the footprint of Muhammad on the stone and a chapter of Quran taken from its original holy book. The Jama Masjid is the largest and perhaps the most magnificent mosque in India.This Mosque is built in yellow sandstone and combines the best of Hindu and Muslim style of architecture.The mosque has three gateways, four angle towers and two minarets standing 40 m high. 5,000 laborers were employed for six years to complete its work.This mosque stands on two hundred and sixty pillars supporting fifteen domes at varying elevations. 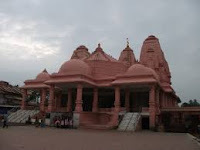 It is constructed with alternate use of vertical strips of red sandstone and white marble. The white marble has been used extensively in the three domes and has been inlaid with stripes of black. The structure was situated on a high platform so that its magnificent facade would be visible from all the neighboring areas. 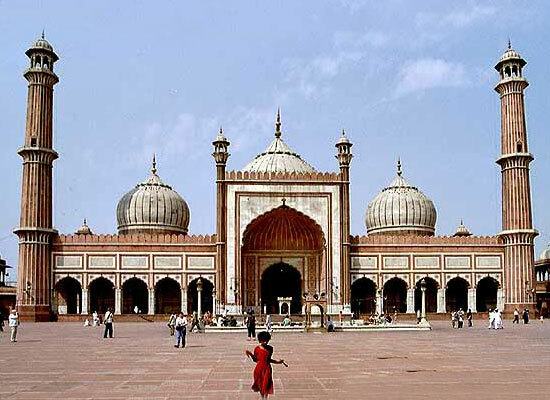 Court Yard: The courtyard of the mosque is about 408 square feet and is paved with red stone that can hold a large number of people. 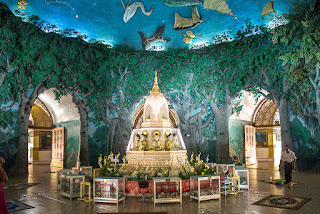 At the centre of the mosque there is a large marble tank in which the devout wash their hands before attending prayers. 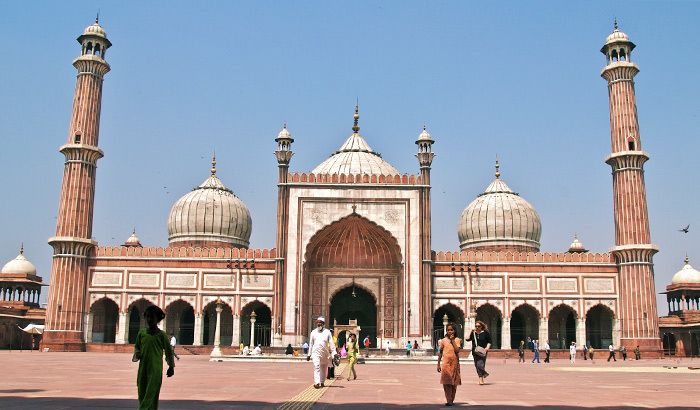 The main mosque is circled by three onion-shaped domes made of white marble and inlaid with stripes of black slates. The shape of the courtyard is rectangular which is about 65 by 76 metres. The central courtyard is reachable from the East, though there are three ways on the other side also. 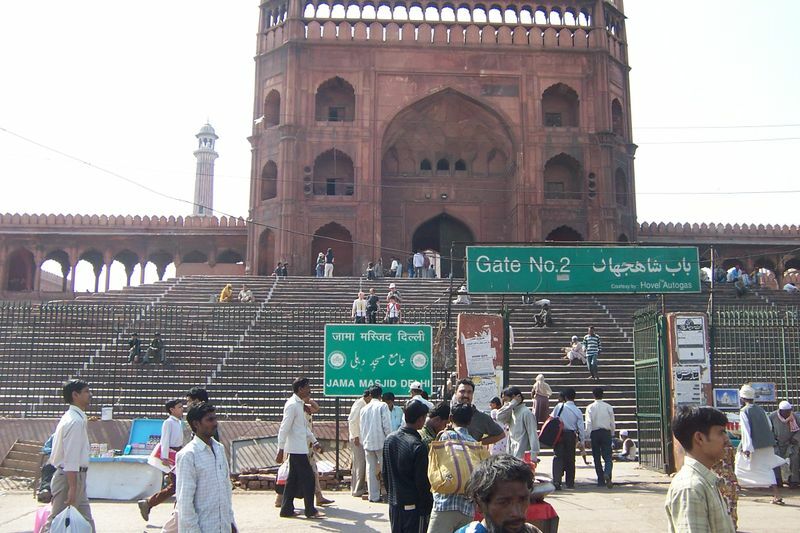 The Entrance at the eastern side leads to another area which has the tomb of Sultan Ahmed Shah. Jama Masjid faces the Red Fort, three gateways, four towers and two minarets on the east. On the north and south of the complex are the two 130 feet high minarets from where an amazing bird’s eye view of the city can be seen. The main gate of the Masjid, the eastern entrance, is usually closed on most of the days of the week. It was perhaps used by the Emperors. Tomb: Near the Eastern entrance stands the tomb of the Sultan Ahmed Shah, which was homage to the Sultan by his son Mohammed Shah II. The tomb houses the graves of three great rulers of Gujarat - Ahmed Shah I, his son, Mohammed Shah and his grandson, Qutub-Ud-Din Ahmed Shah II. After 100 years, a nobleman, Farhatul Maluk repaired the tomb, who also got the walls of the mosque engraved. Today after centuries of heat and uneven weather, Jama Masjid stands unchallenged serving as a prayer place for various Muslims. By Air: The Nearest Airport is Indira Gandhi International airport in Delhi. By Rail: The Nearest Railway station is New Delhi Railway Station. By Metro: The Nearest Metro station is Chandni Chowk Metro station. 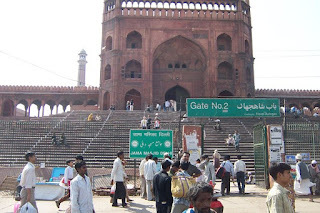 By Road:There are many public and private vehicles available to reach Jama Masjid Delhi. 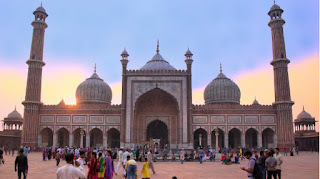 The Delhi Metro and local DTC buses and auto rickshaws conveniently connect Jama Masjid and Chandni Chowk bus stand. Khidrapur which is about 17 kms from Narsoba Wadi via Kurundwad nor the name of Kopeswhar Lord Shiva Temple.Khidrapur is to the east of Kolhapur Maharashtra.Kopeshwar Shiva temple is ancient and artistic situated on the bank of the Krishna.Here is some fact about Kopeshwar Shiva Temple at Khidrapur in Kolhapur District Karnataka India. How to reach by Road: There are many public and private vehicles available to reach temple. 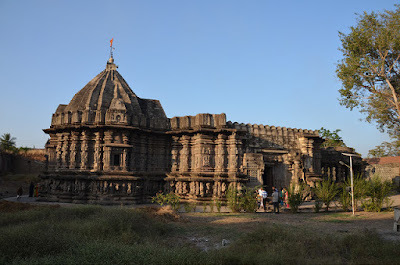 Kopeshwar Shiva Temple is located at on the bank of the Krishna in Khidrapur Kolhapur District Karnataka India.The temple was built in 7th Century AD and built by Chalukya kings.The temple is dedicated to Lord Shiva , here known as Kopeshwar .The temple is known for one of most outstanding and beautiful examples of Temple Architecture in India. 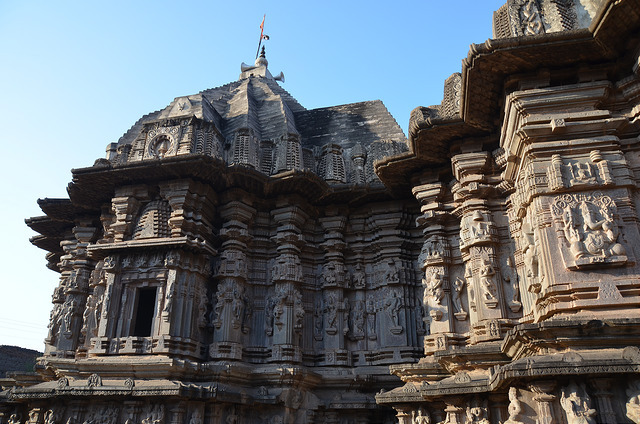 The inscriptions dating back to the 12th century clearly support this.The exterior of which is founded on 92 elephant carvings and the interiors embedded amidst 108 stone carved pillars. Besides, the temple is studded with stunning pieces of carvings, ranging from that of Gods and Goddeses, dancing girls, men from Africa and Arabia besides that of birds and animals.In the interior you see first Vishnu( Dhopeshwar) and Shivling facing north. 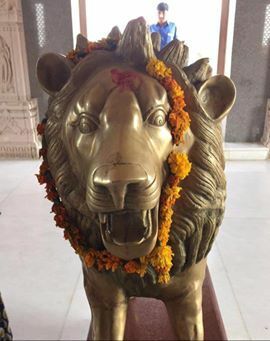 But there is no nandi who has separate Mandir. 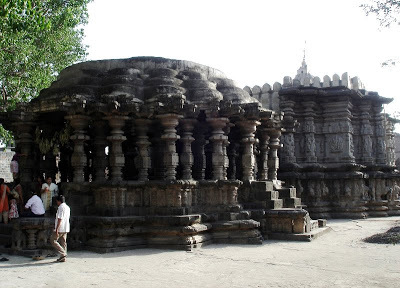 Separate Actor-Pendal, hall, old pillars, carvings of gods and male-female artists in various poses are attractive. 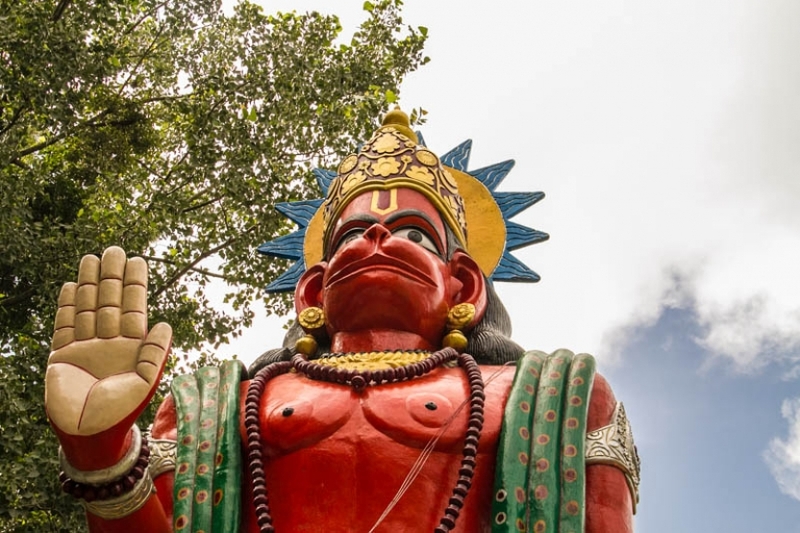 The legend says that When sati Parvati jumped into Daxa sacrifice, Lord Shiva was angry. He got peace of rnind in this temple From entrance to Shivaling, we feel peace, coldness and Dark Shankaracharya had appointed servants for the management. In Shravan on Monday and Shivaratri the Mandir is crowded. 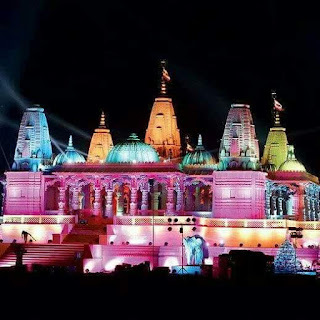 The Temple is divided into four major sections - the Swargamandapam, Sabhamandapam, Antaral Kaksha and Garbha griha. the Swargamandapam is separated from the main temple and has 12 round pillars ascending towards the ceiling. beautiful images of kings, queens and their vehicles are carved on them. 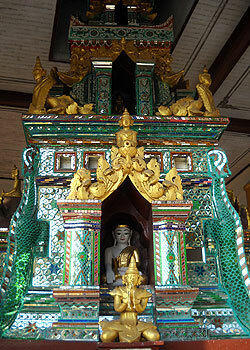 the three rows of 12 pillars each are adorned with beautiful artistic designs. A large, black, flat stone 14 feet in diameter is installed at the centre of the Swargamandapam. The Swargmandapam has a circular open ceiling also made of stone is also intricately carved. meant let out smoke during a Yagna for which the hall was made.The temple today is being restored and is well maintained under the supervision of Archelogical survey of India. 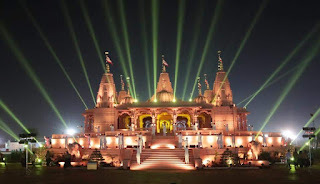 Here is some information about BAPS Swaminarayan (Nagar)Temple in Surat Gujarat India. 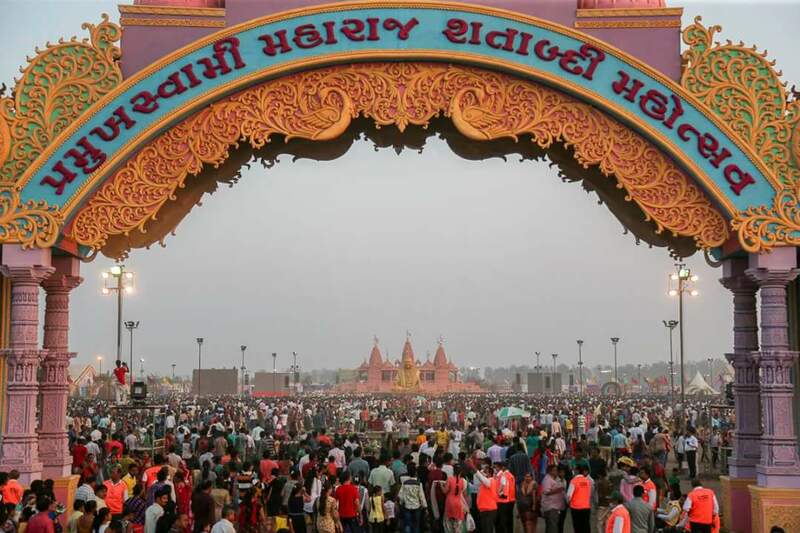 How to reach by Air: The Nearest Domestic Airport is Surat near Magdalla. How to reach by Rail:Surat has own Railway station so nearest station is Surat Junction. 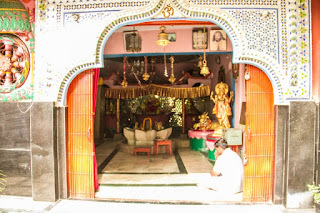 How to Reach by Road: There are many public and private vehicals available to reach temple. 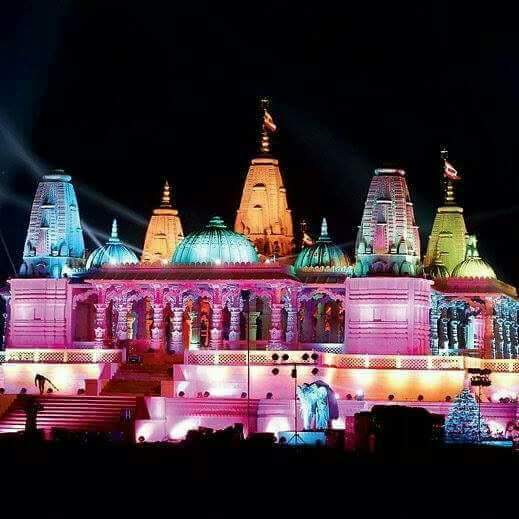 BAPS Swaminarayan temple surat is located at banks of Tapi river Adajan Surat Gujarat India.The temple was built in 1996 and built by Shree Pramukh Swami Maharaj but the new Swaminarayan Nagar was built in few month ago in year 2016.The temple is dedicated to Lord Swaminarayan.The temple, which has three shrines, is brightly coloured and has intricate wooden carvings on its external walls. The first shrine is dedicated to Harikrishna Maharaj and Radha-Krishna Dev. 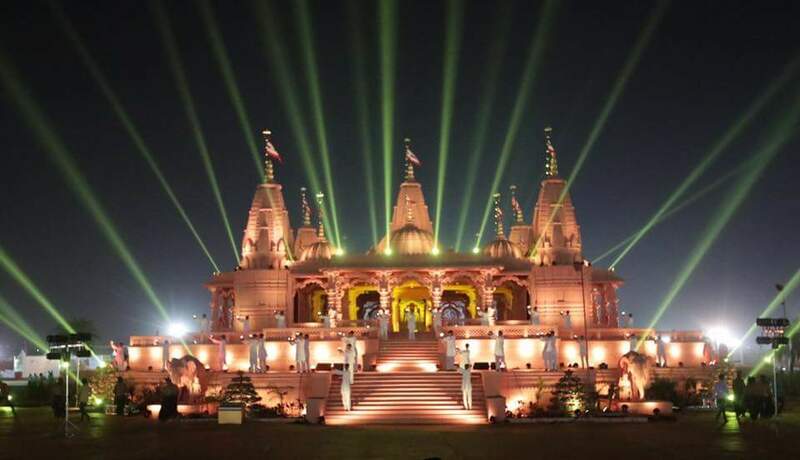 The 2nd shrine is dedicated to Lord Swaminarayan, Gunatitanand Swami and Gopalanand Swami and the 3rd shrine is the abode of Ghanshyam Maharaj. 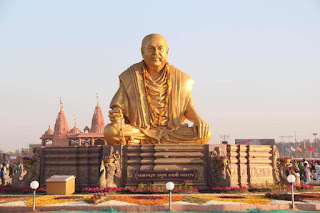 The 10 day(7th Nov to 7th Dec) celebrations to commemorate His Holiness Pramukh Swami Maharaj’s 96th birth anniversary and the 20th anniversary of the BAPS Mandir in Surat were inaugurated by Pragat Brahmaswarup Mahant Swami Maharaj. 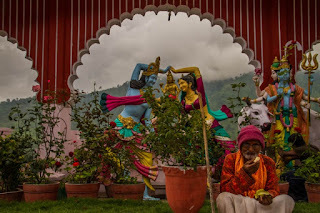 Here is Some Information about Pilot Baba Ashram in Gethia Jeolikote Nainital Uttarakhand India. 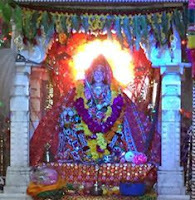 Address: Mahayogi Pilot Baba Ashram P.O. 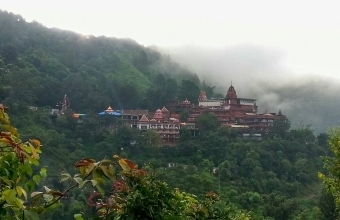 Talla Gethia Nainital, Uttarakhand. 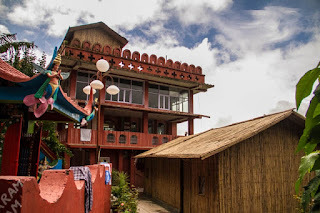 How to reach by Air: The nearest airport is Pantnagar, about 70 kilometer from Gethia. How to reach by Rail: The nearest Railway station is Kathgodam, (40 kms). How to reach by Road:Two main roads come in to Nainital, one to the south at Tallital and the other to the head of the lagoon at Mallital. Traffic coming in from the plains in the south reach at Tallital, while those coming from Ramnagar and Corbett National reserve arrive at Mallital. 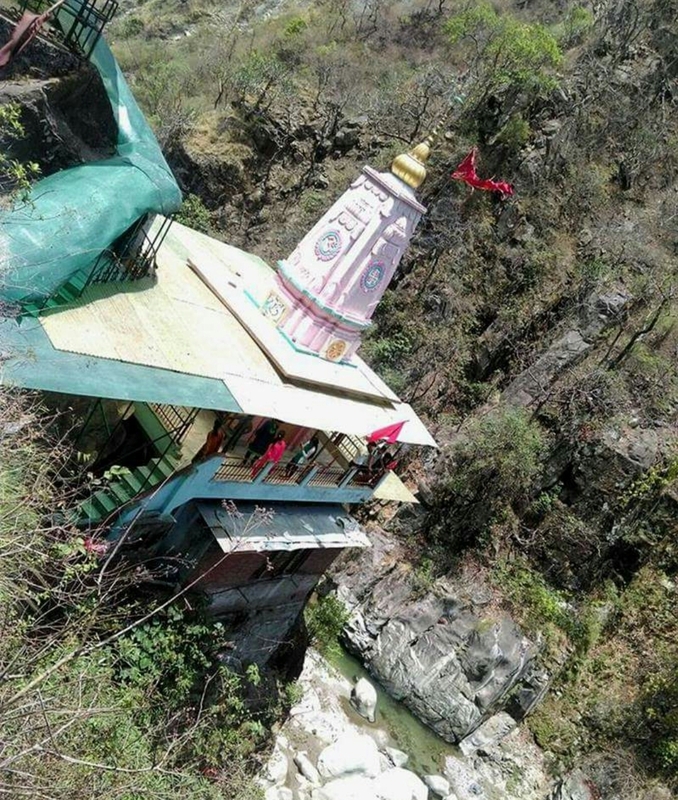 Pilot Baba Ashram is located at Gethia Jeolikote Nainital Uttarakhand.Pilot Baba Ashram was built by Mahayogi Pilot Baba.It is a place where a person can meet to himself as the goal of Mahayogi Pilot Baba is to set an auspicious bridge in between person’s soul and person. 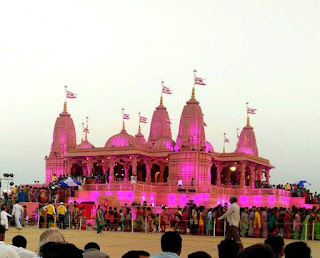 One can witness the ashram life here and get a real meaning of devotion which means losing all the worldly limitations which divide one from existence of God. So, if you are seeking a place for mental peace then Pilot Baba Ashram in Nainital is a right choice for you. 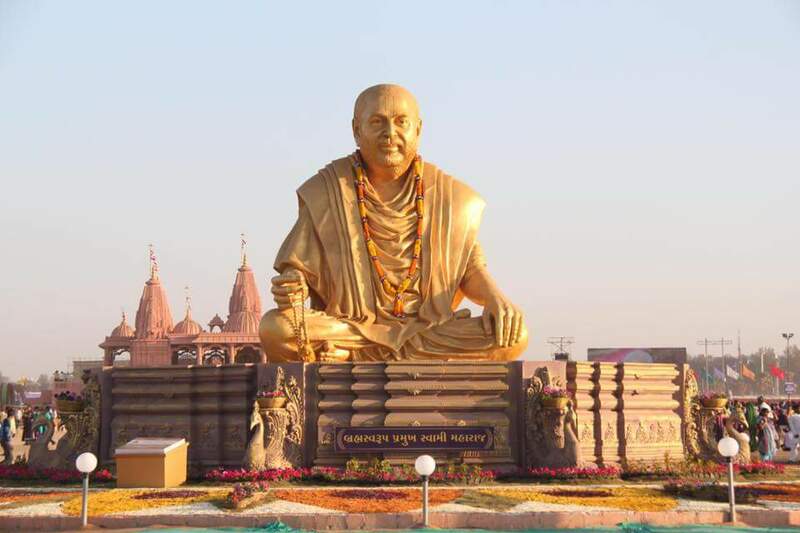 It is a nice treat for nature lovers.In this Ashram very beautiful Hindu god statue look attractive. 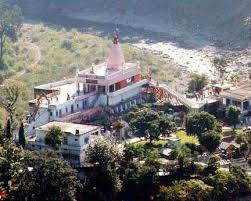 Kotdwara is one of the gateways of Uttarakhand state situated in the foothills of the Shivalik range. Kotwdara is on the border of Uttarakhand and Uttar Pradesh making it easier for business trades and practices. 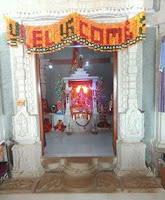 Durga Devi Temple is located at about 15 kms away from Kotdwar. The place is known for its calm and quaint environment. A small river also flows near the temple.Here is some fact about Durga devi temple in Kotdwara Lansdowne Road Duggada, Uttarakhand India. How to reach by Air: The Nearest Airport is Jolly Grant Airport at Dehradun (91 kms). How to reach by Rail :The Nearest Railway station is Kotdwara Station(12 KM). 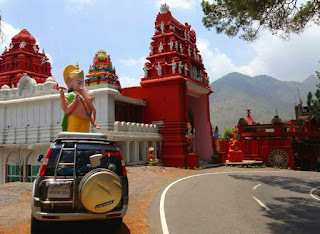 How to reach by Road: There are many public and private vehicals available to reach Durga Devi temple. 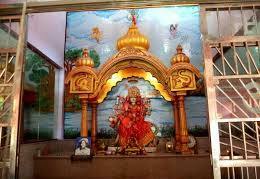 Durga Devi Temple is located along the banks of Khoh River and is only 9kms away from Kotdwar. The temple is dedicated to Goddess Durga Devi.Devotees come here in large number and it is believed that Goddess Durga fulfills all the wishes of the devotees. Pilgrims tie red-chunri that is explicitly dedicated to the Goddess. Besides, a small cave is also located near the shivling and the main temple. 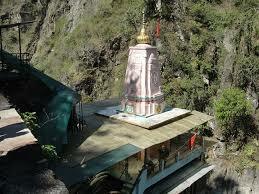 The area around the temple is also known as the best picnic spot in Kotdwar. The astounding view from the temple is simply heart-captivating and tourists find divine peace on the river bank that flows nearby. Numerous waterfalls and hill forests makes the place completely spectacular. 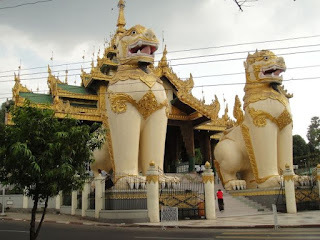 One can travel here at any time of the year except the rainy season as the water level reaches its max.